Gordon van Vliet is a fine oil painter working from his studio in Rochester, New York. 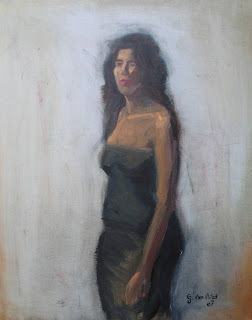 He strives to paint in a direct manner similiar to Sargent, Sorolla, Keiser, Jurick and others. van Vliet sells upon inquiry so please subscribe to vanVlietArt mailing list to receive notice of the latest oil paintings. This was painted as a commission for the couple at right. I was able to warm up the tones from for a better appearance then the reference and darken the background to give more presence to the subject. Due to the limited time for this project I utilized drying agents with the paint. Commission by a daughter of her father who served in the US military during WWII and given to him for Father's Day . Also showing the reference photo. This was a difficult task for me. Inventing the colors, change his shirt color and change his badges and bars to reflect a rank after the photo was taken all took time. I hope you enjoy the result. Oil paint 24" x 36"
This painting is priced at $229 plus frame. Expect a frame for about $39 and up. Email the artist if interested. To be displayed at Steve's Place when dry and framed. Come and see it and enjoy a wonderful breakfast or lunch. Attempt at capturing the sunset. I painted the other day with Josi Etter behind Shoen Place at the Pittsford Farms Dairy, 44 North Main Street, Pittsford, New York. This is perhaps the first warm week of the year and all the greens are coming in on the trees and fields. The proprietor was generous enough to let us paint for a few hours. Here are some links of interest about this wonderful place. Available oil on board 14" x 11" through my shop. $129.00 + $10.00 shipping to the USA. I can ship it framed in a simple black framing for $162.00 + $12.00 shipping to the USA. Foreign or overseas buyers email me for terms. Paypal accepted (use my email address) or credit card direct at The Framing Edge. See right side bar. I saw an ad today in which they used Ben Frankin's quote, " Beer is proof that God loves us and wants us to be happy." Maybe so, but these girls aren't buying it! 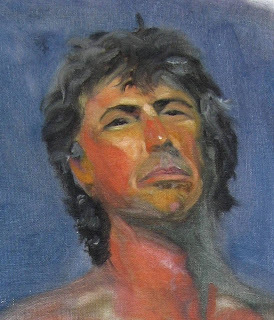 This painting is mark reverso, : Rocky found in Grimes Glen, New York May 1985. Here he is shown enjoying a cigar. He was painted in my old workshop setting. A wine tap was used for the cigar prop. In 1985 I was hiking with a friend when I stopped to look in the stream. Four feet down, through crystal clear water was Rocky, begging to be brought home. He has been a companion ever since. Available oil on board 12" x 15 1/4"" through my shop. Framed in natural pine by artist. $165.00 + $10.00 shipping to the USA. Do we see clearly with unobstructed vision, or do we perceive a distortion through a glass?" Available oil on board 11"" x 14" ready for standard framing and is available through my shop. This piece then it is varnished and ready to go. $189.00 + $12.00 shipping to the USA. I can ship it framed in a simple black framing for $225.00 + $14.00 shipping to the USA. Foreign or overseas buyers email me for terms. or credit card direct at The Framing Edge. The Tin man gets a date. I always wondered what became of the lovable characters from the "Wizard of Oz". Relaxed, hanging out and amused at life as it passes. Available oil on stretched canvas 16" x 20" and available through my shop. Note, this photo is substantially washed out at bottom. Much richer in life. I will try and get a better photo. Without frame - $149.00 + $10.00 shipping to the USA. I can ship it framed in a simple black framing for $182.00 + $10.00 shipping to the USA. The richest thing in life is life, health. Garlic is a treasure for us all. Available oil on board 10"" x 8" ready for standard framing and is available through my shop. This piece then it is varnished and ready to go. $149.00 + $10.00 shipping to the USA. I can ship it framed in a simple black framing for $182.00 + $12.00 shipping to the USA. 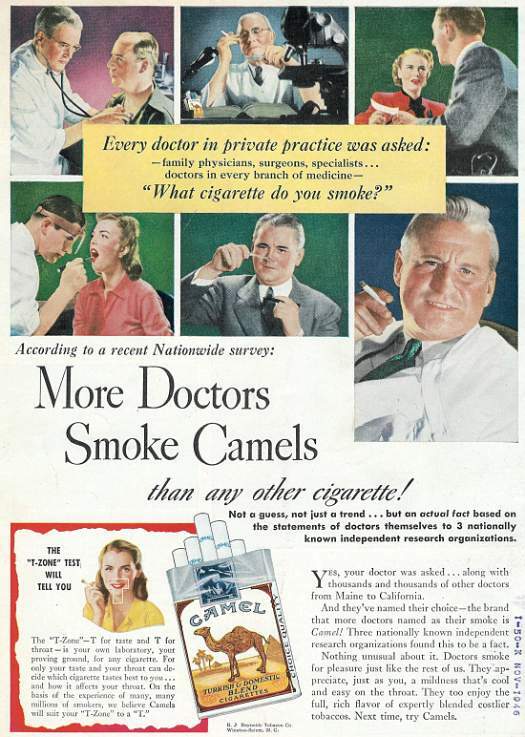 I enjoy an occasional cigar, but this is old fashion junk science. Today I think everyone has been amply warned of the risk. She watches him wondering what he is like and what might be. 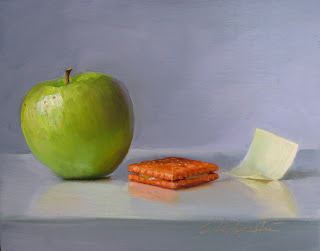 Available oil on canvas with ample material for stretching or hard mounting 5" x 7" and is available through my shop. This piece is varnished and ready to go. $100.00 + $6.00 shipping to the USA. I can ship it framed in a simple black framing for $133.00 + $10.00 shipping to the USA. A red onion with garlic, the onion whiskers brought to mind this child's poem. Available oil on board 10"" x 8" ready for standard framing and is available through my shop. Anyone interested in driving downtown for a little shopping in Bucharest, Romania. Keep some tranquilizers in the glove box. "The Suit" by Gordon van Vliet, a study sketch after Vetriano's, "Angel"
I love Vettriano's simple, bold style. Here is a small copy sketch done today. 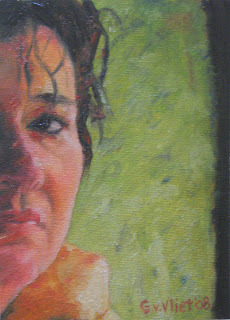 Measures 6x6 oil on canvas. I plan on doing more of these. The sparkles are the light bouncing off the wet paint. If you don't know Jack Vettriano is a contempory Scottish painter. Some hate him and some love his work. I admire his sensitivity to his subject and the deftness of his handling the medium. Jack like to finish his work in one day, often a long day. Better than Twinkies for the kiddies. Served oil on board 10"" x 8" ready for standard framing and is available through my shop. 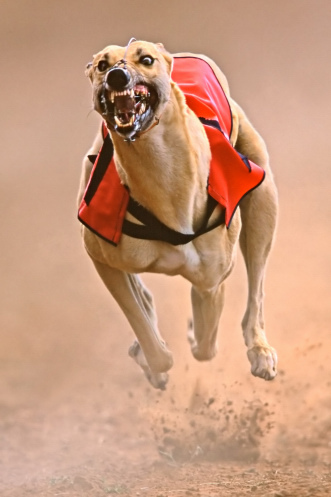 If you ever thought of Greyhounds as a gentle breed, better think again when their chasing a rabbit. Snail above and below is oil on canvas with ample material for stretching or hard mounting 6" x 6" and is available through my shop. This piece then it is varnished and ready to go. $100.00 + $6.00 shipping to the USA. This delicious and exotic painting is served oil on board 10"" x 8" ready for standard framing and is available through my shop. In the market for a small gun to ward off mice? Try Swiss Mini Gun, they have what ever rich girl with a mouse problem needs. The moment of understanding leaves a bittersweet (crooked) smile. Beginning to understand deceit on the old frontier. 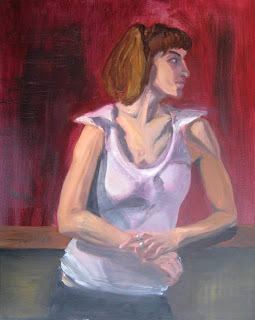 This is a detail from a 16" x 20" figure study. If interested it can be shipped complete or cropped and re-stretched in the portrait size you see (probably 8" x 10"). Oil on canvas, I will add varnish and signature. 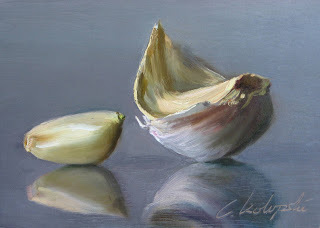 Garlic metaphor for relationships is oil on an 1/8" wood panel 7" x 5" and is available through my shop. This piece then it is varnished and ready to go. $129.00 + $10.00 shipping to the USA. I can ship it framed in a simple black framing for $162.00 + $10.00 shipping to the USA. From the region of Orion's Belt comes Wisps Surrounding the Horsehead Nebula. 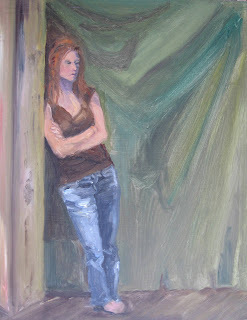 "Waiting", Gordon van Vliet is an image constructed when a niece Chara came to pose for myself and a group of friends. In it you can sense the patience or endurance. Waiting for the painters to finish or her friend to arrive doesn't really matter. The rest is the same. I love those blue jeans! It is oil on canvas, stretched and ready for a standard frame. Measures 16" x 20". This piece then it is varnished and ready to go. $149.00 + $10.00 shipping to the USA. "6 to 4 Kiwi", by Christian D. Kolupski is a wonderful painting, oil on an 1/8" wood panel 7" x 5" and is available through my shop. Fish or Fangs? Nest time you jump in a pond out Utah way beware what lurks under the surface! 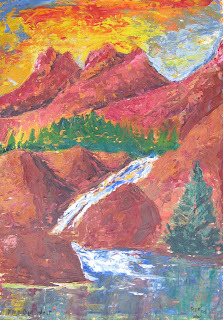 "Fire Out West" is one of the few palette knife paintings I have done. This one is quite colorful and there are many qualities I like. The glow of fire beyond the mountain and the reflected light. 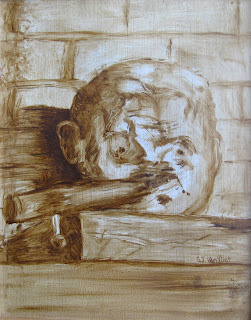 It is oil on cardboard mounted on foam core. Measures 12" x 17 1/2". If you are framing this piece then it is varnished and ready to go. $100.00 + $10.00 shipping to the USA. Or buy it custom framed in a an elegant 3/4" satin black wood frame with backing, hangers etc. $133.oo + $10.00 shipping to the USA. I you are feeling a little sad at work or down in the mouth, try this kit. I like this women standing there. I enjoy the pose, the background with its subtle, aged plaster wall look. Oil on an 16" x 20" canvas and stretchers. Upon request I will finish the edges in a neutral color and add hangers to make the painting displayable without the need for a frame. If you are framing this piece then it is varnished and ready to go. $129.00 + $10.00 shipping to the USA. Some people may be interested in this photo showing the tallest (1 mile) building in the world. You may have to scroll down to see the picture that compares its hieght to NYC. You can feel proud to be taking part in its construction every time you fill up your cars gas tank. :) Well maybe you will feel otherwise. "He Is Not Coming" is the thought going through this womens tortured mind. Stood up, empty bottle of wine, staring into space not out the window expectantly to the road. Flowers stand unaware that the scene is now ruined. Oil on an 24" x 18" canvas board. $179.00 + $12.00 shipping to the USA. Also a cool video. If you like these, I may post them on occasion. Let me know. Velvet Worm Attack Beatle! Gruesome and interesting. 16" x 20" oil on canvas stretched. $100.00 + $12.00 shipping to the 48 US states. I loved painting this model. Her expression and attitude. Lovely girl. I returned from Canada Monday night. We celebrated my Uncle and Aunt's 50th wedding anniversary. It was so good to see so many Dutch relatives. Some even came from DenHam, OV, The Netherlands, where my mom lived prior to 1953. The house she lived in is linked with a photo map. Way back the home built right next to the street was also connected to the barn. Once when I visited in the early 1970's a pregnant cow was in a stall right next to the bathroom. I watched her give birth while I was there and the calf take its first steps. It seems long ago. My wife, son and I spent a night at Niagara Falls on the way home. I have a lot of photos to reference and may do some paintings from them. Not of the falls so much, but architectural shots showing the hustle and bustle of the tourist areas. This is the first Abstract that I am attempting. My thought on this image is a view from above the earth. Fields and smaller indications of life. Inspired by crop circles or mounds and similar contrivances. Last nights show was very good. Many patrons to see the 60 or so works each by a different artist. I spoke with many people. This is an illustration piece done by Chara Dow, my niece. It was an assignment for her art classes at Monroe Community College. I like it a lot and think. Perhaps one day we will enjoy her work in print. Great job Chara. If yo would like to see more of Chara's work, comment or contact me. I won't be posting for a couple of days while I am out of town. Should be painting again on Monday night. Does she raise the light of hope for the departed... or for those who remain? 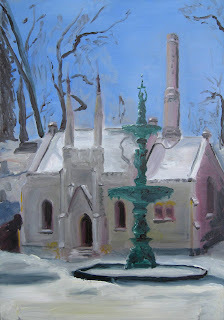 It was painted during a cold morning outing with the GVPAP. I painted along with two other gals. Brilliant blue sky and glow on the snow. This fountain is a wonderful sculpture in its own right. It is painted 16" x 20" on canvas already stretched for easy standard size framing. $189.00 + $6 shipping to the USA. Foreign Buyers contact us for shipping and payment options. Artist retains all copyrights of the artwork. GVPAP recently had articles published in American Artist magazine. Prints, coffee mugs, coasters, puzzles, etc of selected artwork by Gordon van Vliet may be purchased through dA Gallery. Just click on the art you like and look in the left column at dA to see what is available and the purchase price. Daily Painters Gallery is advertising in American Art Collector magazine. This is a gallery I am once again active with. I have redone some of the blog listing in the left side bar. Click on HOME PAGE to see the whole blog site. 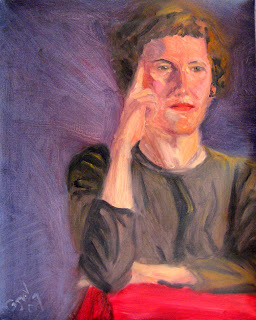 A painting from life done on a Wednesday night at Boxart Street Atelier. A wonderful and beautiful model. 16" x 20" on canvas shipped rolled with extra edges for stretching. $100.00 + $6.00 shipping to the USA. Thank you for looking. Artist retains all copyrights of the artwork. 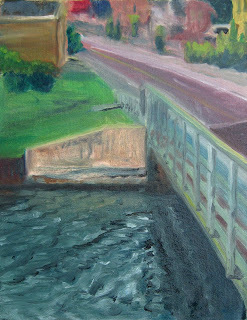 It was painted right here on Edgemere Drive where the inland ponds run under the road to meet the great lake. 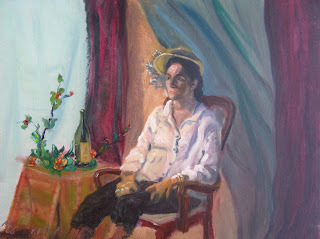 I painted this one morning in 2006 while painting with the GVPAP. It is always fun to paint with them. It is painted from life, not a photo reference. Gordon generally paints at least one painting a week and sometimes daily painting. $100.00 + $5 shipping to USA. 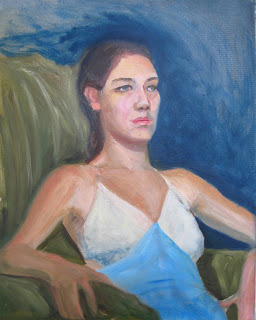 Oil on canvas, image measures 11" x 14" with extra for stretching. Shipping is only $5 because it is on canvas only. You can have your framer mount it on a backing or stretch it on bars. If you live in Rochester, we can do this for you at The Framing Edge if you like. Rochester Real Estate Agent - Information about homes for sale and real estate communities.